You know the feeling: you're happily using one of your favorite web sites when, all of a sudden, you're interrupted by an error message. It can be frustrating. 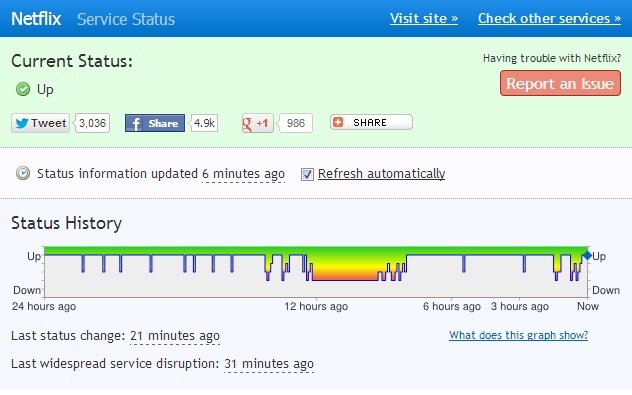 Is there a bug in the web site, or is your Internet provider acting up again? Where can you turn to find out if others are having the same problem? Just visit downrightnow to stay informed. You'll get real-time updates on the status of your favorite web services, both official and unofficial, all in one place. And don't forget to file a report whenever you notice a service issue -- it's easy and you'll let others know they aren't the only ones having trouble. Of course, if DownRightNow.com happens to be down...well, then you're kind of on your own.